Before you buy a new central air conditioner or upgrade you existent one, you should know various specification of the new unit. This is important to get the maximum efficiency, lower power bills, and ultimate effort. You should consult an expert who will evaluate your needs and tell you about the project specifications. They will also keep you informed at every stage of the project and install your system correctly. To communicate your needs to you contractor you should ask certain questions. •	What size or capacity will be best for me? When they give you a size, do not forget to know the formula they used to calculate the size. They should use the Manual J Load Calculation. •	Is it okay to keep the current duct work? In case you are upgrading your central unit, you should ask whether your present duct work will work. Ask them if there are leaks in the duct and if it needs cleaning before installation. •	How long have you been business? What is your availability? Do you receive service calls in the evening and on weekends? Also know the type of technicians they have such as their certification and level of experience. Always hire companies that have NATE certified technicians. •	Do you have relevant documents to show you are licensed and insured? This is important as most states require HVAC professionals to hold license to work. Ask to see the state, local, and federal license, if the company holds them. Insurance is also important as it will protect you in case they cause any damages inadvertently while doing their work. •	Do you have the policy of gathering customer feedback of their work? •	Do you have any quality control systems in place? If, yes how they are implemented? Will you get a refund if you are not satisfied with your service? •	Will you give the total cost in writing? Also ask for cost break-up. There should not be any surprises when the final bill comes. •	Are there new technologies that can be incorporated for more comfort, lower energy cost? •	Is the new system energy efficient? Do all that you can to save on energy cost. HVAC is huge power hog. Ask the SEER of the unit they are recommending for you. Also know the amount of power saving you can make due to it. •	What are the brands that you offer? You should ask them why they offer these and what benefits will you garner from them. 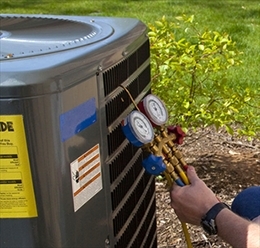 •	Are there any rebates or tax credits available for installing a new system? Also ask what kind of payment terms they have. Can you pay up in small installments? Do they have any financing scheme? •	Will you fetch the necessary permits? Many states require you to get approvals from local authorities for installation. Getting approval will involve lots formalities and take time. If the contractor can do it for you, it will be a relief. •	What kind of warranties will I get? This is very important to get free of cost repair services and parts for a certain period of time. Read the terms and conditions of the warranty very carefully. Know about the manufacturer warranty, material warranty, as well as service warranty. Also know about their post-installation servicing. •	How much time will you take to install the unit? This is very important to plan your schedule. Also ask them if they will haul away your old unit and will there be any charges for it. Also ask if cleaning of the area will be part of their work?